In June, in the middle of the southern winter, we set out from Puerto Williams with the object of passing through the Murray Strait and into Ponsonby Sound. This body of water lies between the Beagle Channel and the Cape Horn archipelago, and it would be a splendid cruising ground but for the fact that the Chilean navy has declared the whole area off-limits to all foreign vessels. To get round this difficulty we arranged to make the voyage with a Chilean friend aboard her Chilean-flagged yacht, Gondwana. This coming summer, Caesar will be skippering Gondwana as she takes guests to visit the glaciers and round the Horn, so it was a good opportunity to get to know how everything worked. Since it was my birthday the others had granted me the right to choose our destination within the sound, and I chose the archaeological and historic site of Wulaia, on the west coast of Isla Navarino. 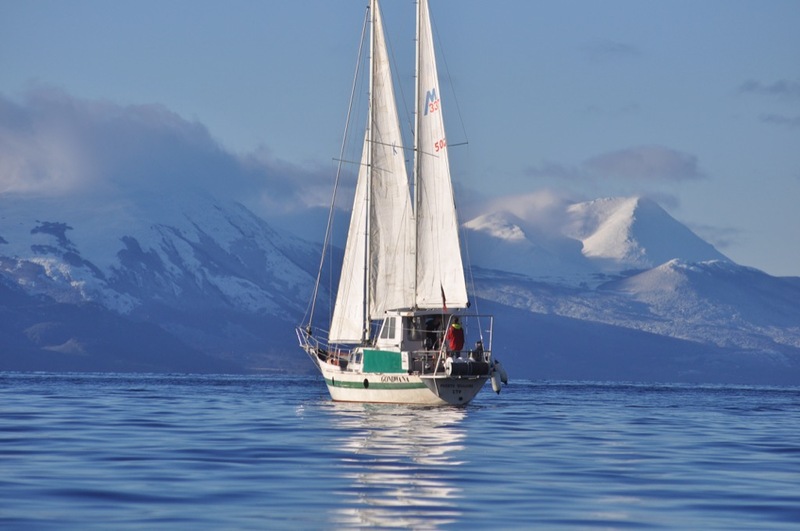 This place lies two short winter days from Puerto Williams, and as we sailed along I had ample time to study our surroundings and relate them to the stories told by Robert Fitzroy and Charles Darwin of the voyage of the Beagle in these same waters. That famous expedition had far-reaching implications, and not only for our understanding of the origins of man. The sun has set behind the snow-covered mountains, and with its disappearance the subtle greens and browns fade from the forests which clothe the lower slopes. The soft lemony highlights and the cobalt blue shadows vanish from the icy mantle, and the placid sea, haplessly mirroring its surroundings, is likewise bleached to a dull metallic grey. 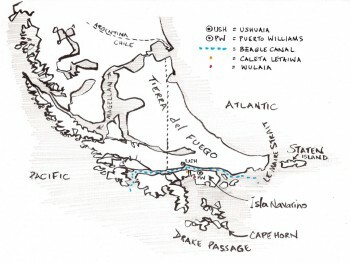 Our day has been spent sliding along the corridor which divides the islands at the bottom end of Chile from the continental mass known as Argentina – but what sense in these names and claims? Down here, at “the uttermost part of the earth”, all is so stark and cold and so vastly empty that the very idea of territorial assertions seems absurd. Nature is the only ruler, down here – and she is not the warm-hearted Mother of our mythologies. If it were not for all these mod cons, we would probably die tonight. As the sky darkens and the white snow becomes grey, we reach our chosen anchorage – a small bay outside the northern end of the Murray Channel. 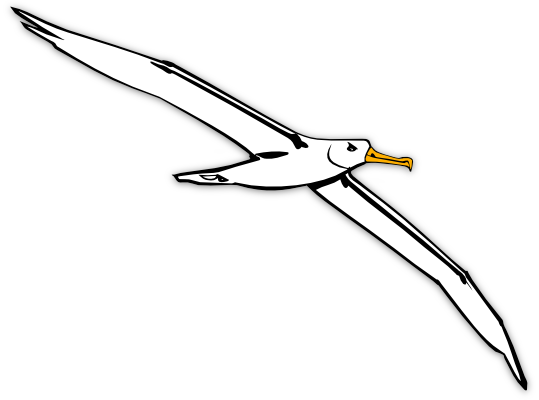 It was named by a Frenchman and carries his name: Caleta Letier. Ahead of us, at the back of the bay, lies a wall of rock and some black trees – and a sheet of ice. As our bow presses against it the ice groans and then, as we proceed, it begins to part. With a noise as of breaking glass we punch our defiance across the frozen lake – but we are not deluded; we see that, in reality, it is our sophisticated means and our civilisation which are fragile. Mother Earth will heal that rift which we have made – and quickly. Perhaps she will even heal it tonight, while we are here; perhaps we will awaken to find ourselves imprisoned in a sheet of glass too thick to be broken…! And yet, although this bunch of well-equipped modern sailors trembles before the might and meanness of this ice-queen Mother, in the time of our grandparents there were people living down here, at the end of the world – and they survived, amongst the snowy slopes and beside the frigid waters, without recourse to Polartec cloth or waterproof oilskins or diesel heaters. The ancestors of these hardy folk are said to have arrived in the region some 6,000 years ago, and although it would probably be an exaggeration to say that they thrived, they found ways and means of surviving the hostile conditions. When the crew of the Beagle came upon them, early in the nineteenth century, the Yaghan were reckoned to number around 5,000 souls. Dwelling throughout the islands and islets which make up the fractured tail-bone of southern South America, they made their abode in flimsy wigwams and foraged on the shore and in the sea for their fodder. They traveled about the canals in birch-bark canoes, even journeying to that inhospitable rock known to us as Cape Horn. And everywhere they went, whether by boat or on foot, the people made fire. That, indeed, is how this region got its name. The Yaghan had to have fire, because not only did they lack Polartec and Goretex, they lacked clothes of any sort whatsoever. It was Ferdinand Magellan who first saw the fires. Intent on finding his way from the Atlantic into the Pacific, Magellan didn’t stop to find out who was responsible for the hundreds of little hearths all along the land to the south of his route. 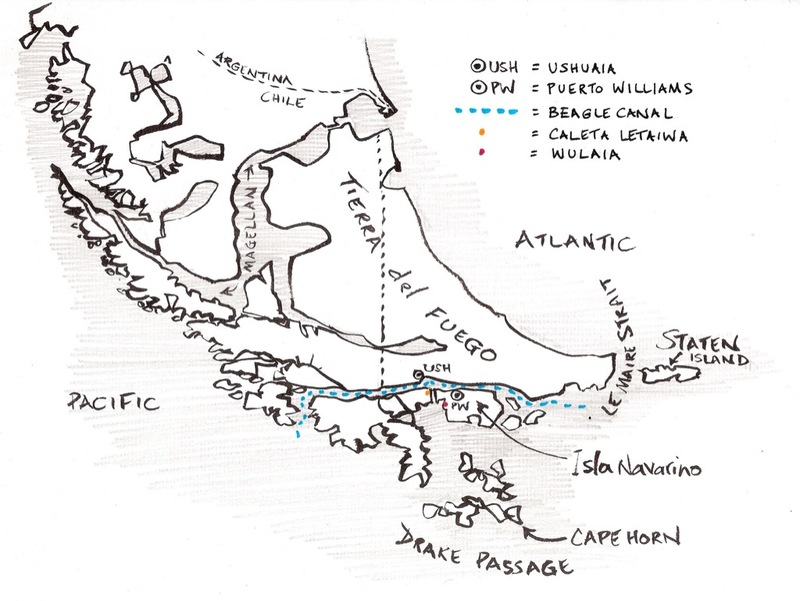 Seemingly, he was afraid that the natives were signalling to each other and telling of the approach of the strange foreign vessel, so he just jotted the information down with his cartographer’s pen – Tierra del Fuego. Had he taken the time to check them out, the Portuguese navigator would have been a lot less fearful and he would have been supremely unimpressed. Nor would the infamous English privateer who followed in his wake, fifty years later, have thought anything but ill of a bunch of naked natives. Being not so very far removed, themselves, from the squalor inherent in mediaeval peasanthood, neither Magellan nor Drake were interested in anyone who didn’t have anything worth stealing. But by the time the British Admiralty rocked up, 300 years later, it was a different story. 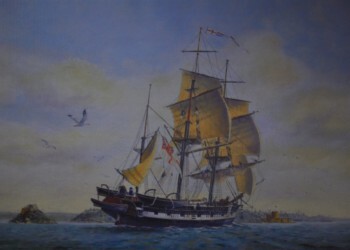 By 1828, Britannia ruled the waves and ruled a large part of terra firma, too – Queen Victoria and her merry men were later to rule over the biggest empire the world has ever known – and from the lofty heights of the most technologically advanced civilisation, the captain of HMS Beagle looked down at the Yaghan and saw Objects of Curiosity. Robert Fitzroy and his men didn’t have the benefit of Polartech etcetera, but they did have a cosy barque measuring 90ft long and equipped with a coal-fired range, and they did have warm clothes. The Yaghan, meanwhile, were more primitive than Otzi, the man who recently appeared from within an Alpine glacier. Otzi lived 5,000 years before the Yaghan, but he had a beautiful copper axe; and he had trousers and a jacket, carefully sewn from animal skins. In fact, he even had thermal undies, made from dried grass, which he wore beneath his leather trousers. He also had shoes whose soles seem to have been specially designed for walking on snow. It’s the fashion, nowadays, to pretend that primitive is not, but there’s no getting away from the fact: the Yaghan lifestyle was as basic as could be imagined. These people didn’t even have clay pots or flint axes, never mind copper or bronze. They did possess bows whose arrows had stone tips, but the majority of their implements were made of wood or bone. They seem also to have lacked any talent for decorating their belongings – or perhaps they just lacked the time to express their artistic nature, their every hour being concerned with survival. The nearest comparison ought to be with the Inuit and their brethren, but whereas those northern tribes had invented igloos, parkas, snow-shoes, oil lamps, sledges, snow-goggles, and kayaks, the Yaghan were surviving with the same kind of equipment used by the desert-dwelling Bushman. Indeed, it has been suggested that in their technological achievements the Yaghan had advanced no further than Homo neanderthal. How do you invent chopping if you’ve never seen chopping? I’ve no idea; and the Yaghan didn’t manage it. The stone scraper and the basic axe evolved while man was still growing up in Africa, and he seems to have arrived in Tierra del Fuego with a tool kit no more advanced. While Palaeolithic Europeans learnt to drill through stone, the Yaghan never even found out how to make holes in wood. Presumably the population was subsequently too small for the one-in-a-million genius to arise. That, seemingly, is also the reason why the tribe went naked but for a seal-skin cape, which hung down their backs. They huddled around their fires, and the capes kept the heat from wafting away into the forest. Apologists say that they would have been colder with clothes, because the fire wouldn’t have warmed them so easily… Various sailors reported on the fact that the Yaghan spent much of their time crouched and even walked in a crouched manner, and photos of them confirm this fact. When away from their hearths – when standing on the cold iron deck of a ship, for example – they tended to stand with hunched shoulders. Encountering the Yaghan for the first time in 1778, an English captain described them as “miserable savages… half dead from hunger, stupefied and unresponsive.” He reckoned that, being “unable to protect themselves from the harsh climate, they had sunk to the lowest level of human existence, on a par with the unreasoning animals.” It’s not politically correct to say so, of course – nowadays we’re supposed to consider these reports uninformed and racist – but I reckon the man had a point. I also reckon that the vast majority of us, if placed in this environment and obliged to survive on our wits, would very rapidly sink to the level of animals. Or else we’d just die. Certainly, Captain Robert Fitzroy was shocked both by the sight and the smell of the naked natives. In his account of the voyages made by the Beagle he tells us that they were “hideous… filthy, and most disagreeable from the quantity of seal oil and blubber with which they had covered their bodies.” Even so, this young English aristocrat did not dismiss the people as being worthless. In his dealings with the Yaghan, as indeed with all whom he met, he was invariably respectful and kind. No doubt his behaviour stemmed from a sense, instilled in him during his upbringing, of noblesse oblige. As a matter of fact, Fitzroy seldom actively sought encounter with the natives. 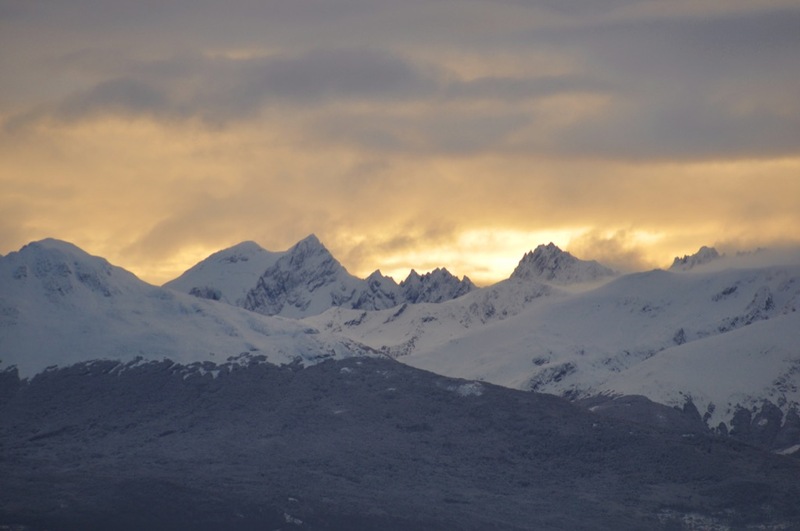 He had been sent to Tierra del Fuego to explore and chart the region, and this business he pursued with gruelling thoroughness and efficiency. His ship carried three small boats, and these were regularly despatched on missions of discovery. Although little bigger than our own sailing dinghy, they criss-crossed the stormy Strait and wended their way up each and every canal; and they were not just sent out on daily excursions; they were often away for a week or even a fortnight. Whereas many captains might have preferred to command the mission from the mother-ship, Fitzroy liked to be fully involved in whatever was going on and he generally skippered one or other of the survey boats. In this capacity he gained first-hand experience of the perils which face anyone so rash as to go messing about in a small open vessel in these waters. Through the snow and the rain which drenched the sailors’ clothes and left them shuddering, through the gales which whipped up the waves and threatened to sink his boat, the young man remained uncomplaining. The only concern that he ever expresses in his logbook is for his hard-working crew. One might imagine that this sort of thing was hardly the usual lot of a blue-blooded gentleman, but in fact it was not until the nouveau riche railway barons and industrial entrepreneurs of the Victorian era polluted the gene pool that wealth and a title came to be associated with a pampered way of life. Until that time, nobility brought with it a duty to lead the underlings in the defence of the realm, and a young man was expressed to prove his worthiness for the rank and role to which God had appointed him. Exhausted, sodden, melancholy, and hungry are words which crop up often in Fitzroy’s tale – but only in reference to the men. Whenever he met with the Yaghan, Fitzroy bartered for arrows and shell necklaces and otter-skins, and for the crude capes which the people wore on their backs. 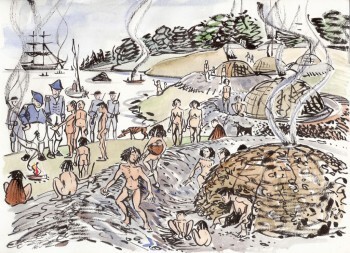 Being all too familiar with the suffering which the climate brought to himself and his men, he marveled at the natives’ ability to endure the bitter weather without any sign of concern. He also admired the speed with which they could conjure up a fire, for often-times, as he tells us, it took him and his men several hours to persuade the damp wood to catch. The Yaghan lit their fires by sparking iron pyrites, but the Victorian sailors didn’t want for flints (which were just as good), they simply couldn’t get the smouldering fire-cloth in their tinderbox to ignite the timber. Having spent this past winter nursing our own little wood-burning stove on a diet of soggy driftwood, I also envy the natives’ ability. Mind you, I suspect that they seldom needed to start a fire from scratch, because they carried it with them in their canoes. On Fitzroy’s second voyage, two men passing the night ashore died of hypothermia when they were unable to light a fire. Fitzroy tells us that the Yaghan were very skilled in the use of the slingshot, being able to hit a sailor’s cap at fifty yards. The men carried their slings with them everywhere they went. Some of them also used bows and arrows, with which they killed birds; and they had stone-tipped spears which were used both for killing seals and also in battle. For close-quarters fighting they used clubs and stones, held in the hand, and short wooden daggers pointed with flint or quartz. As Fitzroy and others were later to learn, the people were also capable of hurling stones with deadly accuracy. They were strong – one young Yaghan was easily stronger than two of the stoutest English sailors – and although Fitzroy did not suspect it, they could be easily prompted to bouts of murderous violence. Later reports say that one of their favourite ways of attacking someone whom they hated was to leap on him while he was unawares, bend his head back sharply, and so break his neck. When they saw the wondrous things which the Europeans possessed, the Yaghan gazed, not just with surprise but with stupefaction – or so Fitzroy tells us. However, he seldom needed to part with any item of value in order to make his purchases, beads, buttons, and coins being so highly prized as to buy whatever was wanted. On one occasion a young chief, or head of the family, offered his wife in exchange for a button, and she eagerly displayed her supposed charms in an attempt to seal the bargain. On another, a man offered his 16 year old daughter for a similar trifle. Fitzroy declined both of these offers – but they evidently gave him pause for thought. 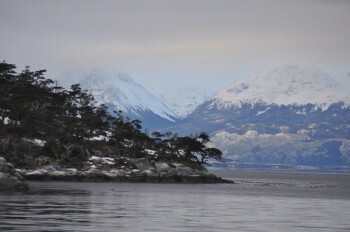 The northern jaw of Caleta Letier, with the Argentine coast in the background. As we sail into Caleta Letier and drop anchor through the ice, I cast my eyes over the shore and try to picture a native wigwam with a family crouched nearby. “In the summer it would be a lovely place,” I muse. But summer, in these parts, is nothing to write home about. I think of the Yaghan women, who used to break the ice before they dived for crabs and mussels. Through half-closed eyes I can almost see their menfolk setting off in their fragile canoes to hunt for seals. I’m not at all sure that it’s a happy picture that I’m conjuring up. Could anyone truly be happy living naked in this climate? But at least the Yaghan lived on their own terms, as wild as the animals and as free as the animals – until the day when a man bought a boy for a button and their world was forever changed. It was in the mouth of this very bay that there fell the seed whose growth, spreading like bindweed, choked the Yaghan’s uncivilised civilisation. The cold hills stare down at me. The ice glints cruelly. In my grandmother’s time a people lived here… and it was not the vicious wind or the pitiless sea which wiped them out. Have just read “How not ….” with enormous enjoyment and great admiration for your achievements. 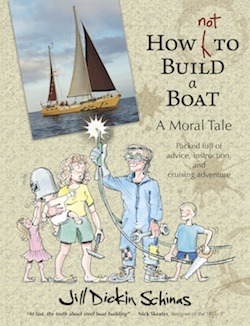 Am much relieved to see from this website that you are now enjoying the benefit form your long struggle to get the boat finished. Have done two Atlantic crossings – one via Senegal and the Cape Verde Islands so can appreciate just a little your way of life. Thank-you, Tony, for your kind comments; and a happy Christmas to you, too!